The capital of Europe has become the focal point once again of the continent's war on terrorism. Tuesday morning blasts rocked Brussels' airport and metro system, just days after one of the key suspects in the November Paris attacks was apprehended in a suburb of the city. Photos from the multiple Brussels attacks show how devastating the blasts were and authorities' efforts to gain control of the situation. As many as 28 were killed according to initial estimates. The Belgian broadcaster VTR reported that 13 were killed at the airport. Another 15 casualties have been confirmed in the metro blast according to a transit system spokesman. The injured are expected to number around 90 between the two sites. The first two explosions occurred at Brussels Airport at about 8 a.m. local time in the departure hall near the American Airlines counter. About an hour and 15 minutes later, the other blast went off in the metro system. Smoke was seen billowing from the Maelbeek station — just blocks from key European Union institutions. 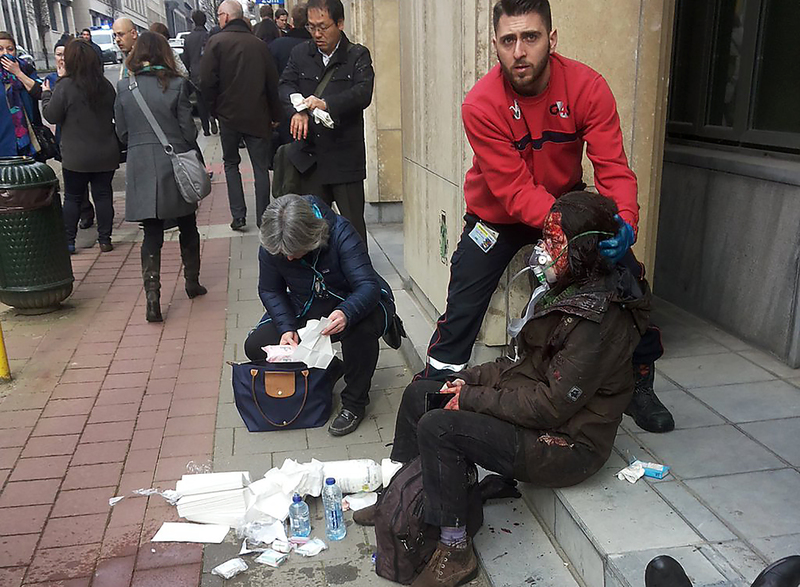 All Brussels residents and travelers have been asked to remain inside. All flights and trains to and from the Belgian capital have been cancelled and public transit is not running.